The British Raj and the effects of colonialism would have been uppermost in EM Forster’s mind when he sat down to write his stirring tale of imperialism, prejudice and civil unrest, A Passage To India, in 1924. The book was not only acclaimed in Forster’s lifetime but has since been recognised as one of the most important novels of the 20th century. No wonder that it was eventually turned into a play, for both the stage and screen, and an Oscar-winning movie. Now the sights and sounds of an India struggling for independence, amid the turmoil and bigotry of English oppression, has returned to the stage in an evocative and compelling new adaptation. 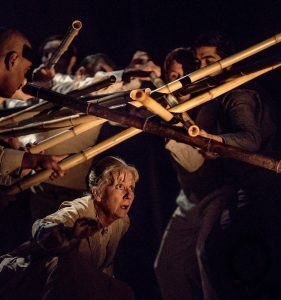 A Passage To India opened its short national tour at Northampton’s Royal & Derngate Theatre last week and is now thrilling fans at Salisbury Playhouse. Co-produced by the R & D, as part of its Made In Northampton season, and Simple8, and adapted by Simon Dormandy, the production conjures up a romanticised India, bathed in warm orange light and echoing to a wonderful score by Kuljit Bhamra that is played live on stage. But Dormandy’s version can make your head spin. His savage editing of Forster’s rambling story results in the audience being swept through some of the book’s key scenes with unnecessary haste. With a courtroom climax done and dusted shortly after the interval the story rapidly changes pace, runs out of steam and energy, and leaves theatre-goers kicking their heels and listening to a polemic on race and integration. Characters are overtly stereotyped but that doesn’t detract from some superb performances by this ensemble cast, particularly Richard Goulding as idealistic, liberal-minded academic Cyril Fielding, and Asif Khan as a doctor accused of improper conduct with an Englishwoman. Recreating an India of elephants, temples, mystical mountains and vibrant marketplaces, not to mention the all-important Colonial club, hub of British ex-pat society, is no small feat and, thankfully, Simple8 don’t even try. 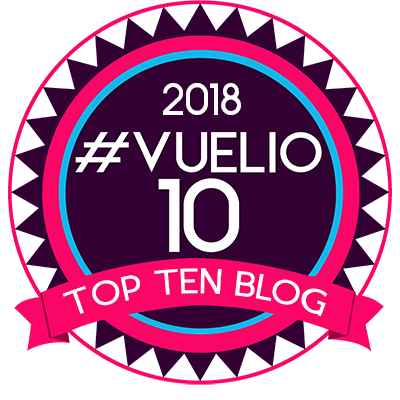 Instead the production is pared down, with very little in the way of set, and the only props are cleverly utilised bamboo poles and a few packing cases. But Prema Mehta’s impressive lighting sets the scene, the sweltering heat of Chandrapore almost shimmering off the stage, while the menacing intensity of the fictional Marabar Caves are a sinister and starkly foreboding trick of the light. 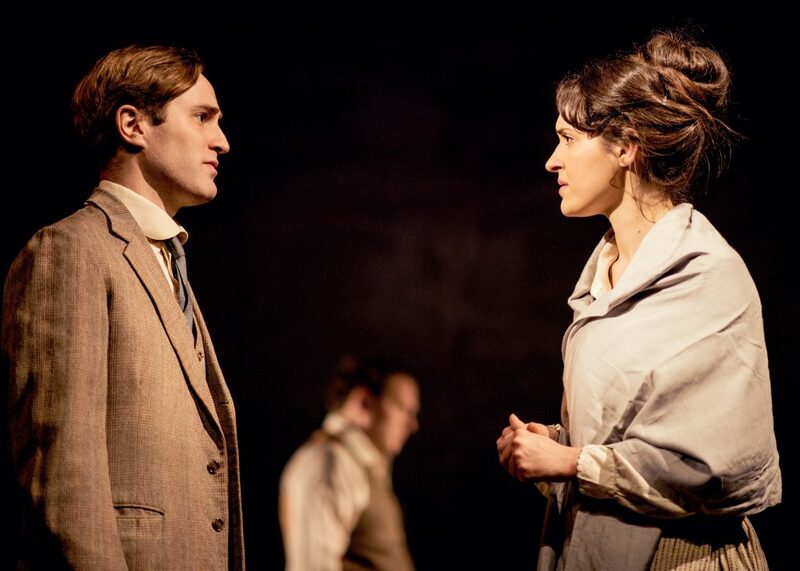 The prim and proper Adela Quested (Phoebe Pryce) has travelled to Northern India to discuss marrying the son of her travelling companion, Mrs Moore (Liz Crowther). When she gets there she encounters a world that is alien to her. The native population yearn for their freedom and independence while the governing British keep tight control on the country. Adela wants to see “the real India,” despite warnings by her English hosts not to fraternise with the locals, and she gets her chance when Mrs Moore strikes up a friendship with a young Muslim doctor. He organises a tea party at the mystical Marabar Caves. But the event goes disastrously wrong. “One cannot be friends with the English!” Aziz is warned by his friends but he ignores the advice and finds himself in jail on a charge of sexual assault. The resulting court case pitches two nations, and their entrenched beliefs, against each other with prejudice, superstition and partisan grievances on trial in a battle for the doctor’s life. Edward Killingback, as Adela’s possible intended, Ronny, raises the ability to sneer almost to an art form. He occasionally lurks in the background of a scene displaying a look of utter contempt for the Muslim and Hindu locals. By far the worst racist (although it is difficult to distinguish as most of the white male characters are appallingly bigoted), is Matthew Douglas’s doctor, Callendar, who is very much of the “flog ’em all” brigade. Meanwhile Ranjit Krishnamma’s long-winded and ponderous Brahman, Godbole, is rather too much of a caricature and Aziz’s friends Hamidullah (Tibu Fortes) and Mahmoud Ali (Maanuv Thiara) are under-written. Caught in the crossfire is the more nuanced and intriguing relationship between Cyril Fielding, who runs a local government college, and Aziz and it is well played by both Goulding and Khan. Is A Passage To India a child of its time or does it have something relevant to say in the modern age? One would like to think that attitudes about race, colour and religion, have improved since the days of the Raj but, in truth, sadly, we know that little has altered. This is a bold, imaginative, innovative and enjoyable production but its Simon Dormandy’s ambitious adaptation lacks a firm conclusion, losing its way a little after the court case. 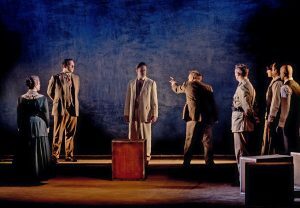 Running at Salisbury Playhouse until Saturday. 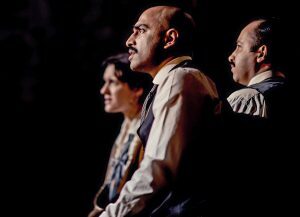 Simple8’s production of A Passage To India is brooding and intense with evocative music and lighting, and compelling performances from its ensemble cast led by Richard Goulding and Asif Khan.